Alto saxophonist and composer Will Vinson will continue the celebration of his sixth album, and his debut for 5Passion, Perfectly Out of Place, with dates on both coasts, July 16 at The Blue Whale in Los Angeles, followed by July 25 at The 55 Bar in NYC! Vinson possesses many gifts; incredible power, dramatic sensitivity, prodigious technique, and perhaps most importantly, a captivating sound that you want to hear again and again. John Fordham of The Guardian described a "superb solo of rugged leathery sounds turning into mellifluous high notes", with "secure control and storming energy". While JazzWise Magazine has said that Vinson has a knack for "combining a thoughtful originality of conception with energy and fluidity of execution in very satisfying proportions". It is this abundance of qualities that has made Vinson a serious part of the conversation when talk turns towards modern jazz musicians who are playing and composing with a high level of originality and artistry. In addition to being an acclaimed bandleader with five recordings under his own name, Vinson is a member of several leading ensembles: Gonzalo Rubalcaba's Quintet (appearing on the Grammy nominated albums Suite Caminos, and Charlie), Ari Hoenig's Punk Bop and Nonet, Miguel Zenon's Identities Orchestra (Grammy nominated for Identities are Changeable), and the much lauded OWL Trio (with Lage Lund and Orlando le Fleming). Vinson has also toured/recorded with Rufus Wainwright, Sufjan Stevens, Sean Lennon, Martha Wainwright, Beth Orton and Harper Simon. Will Vinson is proud to announce the release of his debut recording for 5Passion and his sixth overall, Perfectly Out of Place, featuring an all-star group comprised of Mike Moreno on guitar, Gonzalo Rubalcaba on piano, Matt Penman on bass and Jeff Ballard on drums. Perfectly Out of Place follows a string of inspired albums from Vinson: It's For You (Sirocco Jazz, 2004, "an auspicious debut, an album that is as mature in its conception as it is in its execution" - The NYC Jazz Record, formerly AAJ New York), Promises (NineteenEight Records, described as "impressive" and "coolly restrained" by Nate Chinen of The New York Times), The World (Through My Shoes) (a live recording called "marvelous" by DownBeat Magazine and "exhilarating, cascading ... outstanding" by JazzTimes), Stockholm Syndrome (2010, Criss Cross Records), and Live at Smalls (2013), one of the most successful albums on the Smalls Live label. With Perfectly Out of Place Vinson felt ambitious. This album contains more-than-usual through-composed music from the saxophonist's pen, and also marks his first use of overdubs, synthesizers, vocals and strings. His aim was to enhance and augment his Quintet's sound (featured on Vinson's previous five albums) that many fans and critics have come to know and love. Vinson elaborated in the album's liner notes, "It was an exciting prospect for me, but one that was made challenging by the stubborn insistence of everyone in the band on making everything sound immediately perfect and unimprovable . . . you get what you pay for, I suppose. I've tried to add without inadvertently taking away, and I hope you feel it's been a success." He added, "The entirety of this project, from the music's conception in the mountains of Banff, Alberta; through the joyous session at Avatar (to my knowledge the world's greatest recording studio), has been a thrill. One that I'd be happy to go through again, if it weren't for the fact that this record is now complete and in the hands of the most important person in the process, the listener." 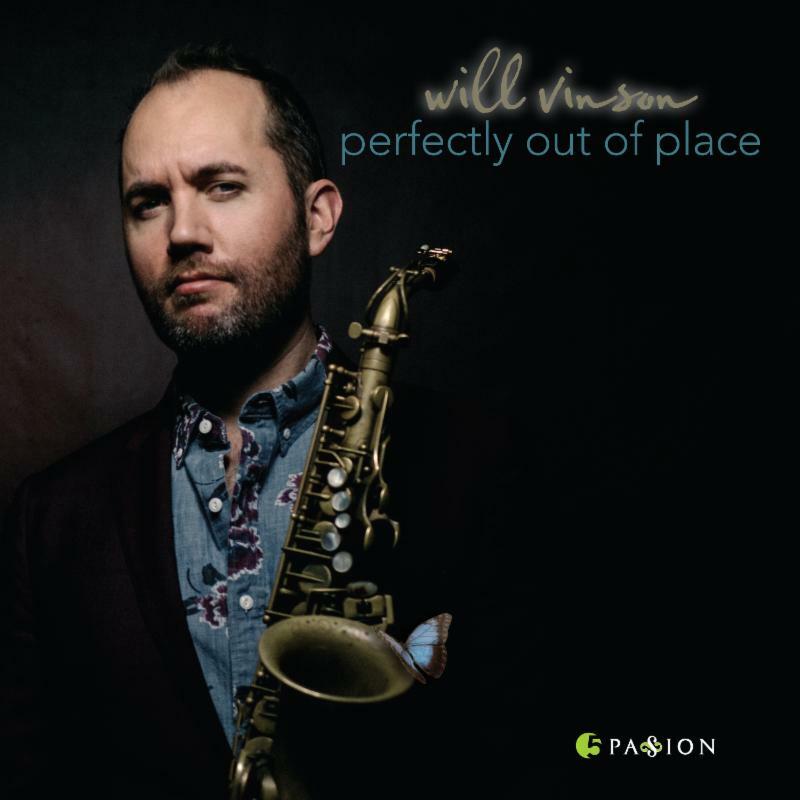 Vinson's collaborators on Perfectly Out of Place include four of the world's most extraordinary improvising musicians, Mike Moreno, Gonzalo Rubalcaba, Matt Penman and Jeff Ballard. "Their importance to this project cannot be overstated, each one of them being irreplaceable. It's fair to say that my personal aesthetic identity would not be quite what it is without the influence of these masters over the past (gulp) two decades," said Vinson. The saxophonist also felt exceptionally fortunate to be able to enlist Jamey Haddad (heard on "Skyrider"), Jo Lawry (heard on "Desolation Tango" & "Skyrider"), and the Mivos Quartet (heard on "Desolation Tango", "Skyrider", "Intro to Limp of Faith") to contribute to this project. "Jamey's vibe and generosity of spirit are legendary, and his playing joyous and infectious. It's hard to think of anyone other than Jo who would have the chops, not to mention relished the challenge, to achieve what was asked of her in this recording. I first heard Mivos right at the time I was beginning to consider using strings on this project. They performed Steve Reich's Different Trains and completely blew me away", said Vinson. On Perfectly Out of Place, the listener gets unadulterated "Will Vinson music"; which not only means playing and composing that combines a great knowledge and respect for the century-long jazz tradition, with explorations into the rhythmic, harmonic and melodic realms of contemporary forms, but this artist's brilliant vision brought to life with great skill and unmitigated passion. All compositions by Will Vinson. Produced by Will Vinson and Gonzalo Rubalcaba.